You can have your Santa with his big sack of toys, any old day. 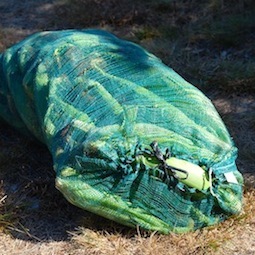 Our Santa leaves something much more delicious—bushel bags of sweet corn. Instead of showing up only one night a year, he drops by every other day. And he doesn’t come down the chimney. At least I don’t think he does, because the sack of corn is always down by the northernmost farm gate. (And we don’t have a chimney). But I never see Santa. He and his elves alight in the cornfield and disappear among the tall rows of corn stalks. 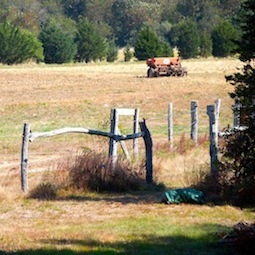 On my way down to do my chicken chores, I’ll glance at the gate, but nothing’s there. Half an hour later, about the time the sun is just high enough for me to peel off a layer, I circle around the pine grove and, look, there it is! A big bag of fresh-picked corn. With Roy gone to work, I’m left to find something with wheels to haul the bag up to the farm stand. I don’t mind the effort, because I always start smiling when I see that corn. 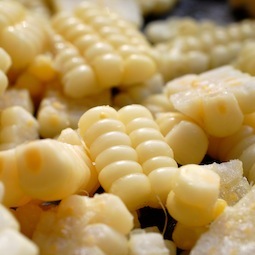 What could be better than having oodles of fresh sweet corn around! This week we’re getting a variety called Sparkle—last week one called Providence, and my favorite, old-fashioned all-white Silver Queen. Okay, truth is, Santa is really Morning Glory Farm farmer Simon Athearn, and the elves are his corn-picking farm crew. (But I really don’t see them.) We get to sell their delicious corn at the farm stand this time of year, as their late varieties are growing right next door to us. The corn is so good and there’s so much of it right here, that we decided to “reappropriate” a dozen (or so) ears today and get them processed for the freezer. 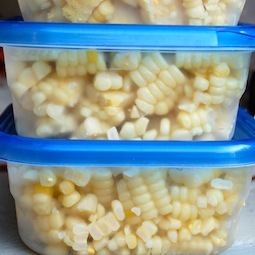 Blanching and freezing corn is not rocket science. (See easy direx here.) But I remember doing it a few years back and not being so happy about the results after a few months in the freezer. 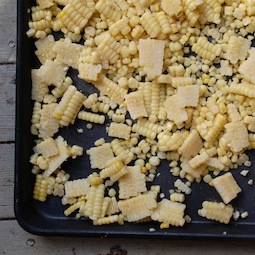 So I took extra care today not to overcook or waterlog the corn and to spread it out on sheet pans to freeze before packing. (I wish you didn’t have to blanch it at all, but you must or an enzyme will hasten the deterioration of the corn). To my great relief, we now have sweet corn in the freezer for the cold months. We could even have it for Christmas, no Santa needed. 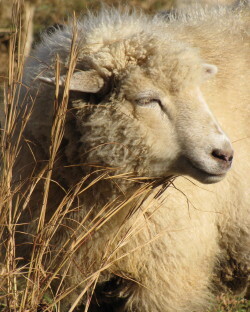 When I first got to the Vineyard, I was totally charmed by farm animals. Back in my suburban I-95 world, I hadn’t run into a lot of pigs and goats, much less a baby lamb or a pair of hulking oxen. I traipsed (okay, maybe trespassed) all over the Island, taking pictures of anything with four legs or feathers. I got lucky I guess, or maybe I was entranced, because I took a lot of nice photos of critters (some of my favorites are above). 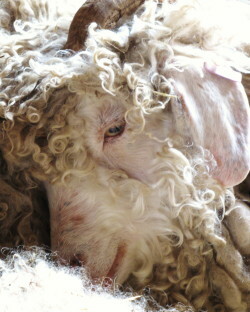 Sometimes the animals even looked at the camera. Lately it seems my luck (or probably my patience) has run out. 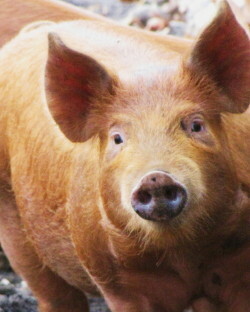 Granted I don’t have a lot of time to wander around stalking farm animals. 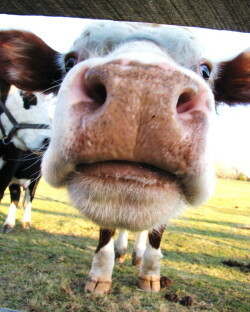 But when I do get close to a critter with the camera, I get mooned. Yeah, butts. Especially chicken butts. 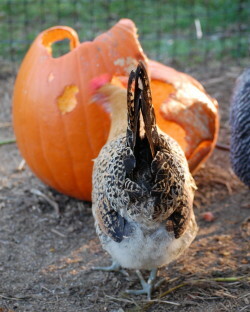 This week, I wanted to blog about our chickens…and their beautiful eggs…and about how wonderfully efficient they are at processing leftover food (and other farm compostables, like pumpkins). Yes, I know I’ve talked about this before, but after ranting about waste and expense last week, I had to share the satisfaction I got out of watching the hens efficiently turn our jack-o-lantern into fertilizer. But the ladies would not cooperate for a good picture. When I got in the pen with them (to avoid shooting through the deer fencing), of course they all rushed away from the pumpkin and towards me. I crouched down to frame the shot and Perky jumped on my leg for a visit, while Martha and Opti started pecking at my boots. Very distracting. In the end, the best shots I got were of tail feathers. Granted those chicken butts are cute (and soft, too). But they’re still butts. Oh, well. I finally realized that Thanksgiving is a breath away, and that it might be nicer if I paid attention to our country’s biggest cooking holiday for this blog instead of some chicken whim of mine. So I marched into the kitchen and made a new version of one of my favorite gratins from Fast, Fresh & Green—this one with a big enough yield to warrant a place on the Thanksgiving table. It turned out so well that Roy and I both snacked our way through the afternoon on it. It features my favorite fall harvest combo—butternut squash, leeks, and corn—and, oh yes, a bit of cream and Parmigiano, plus thyme and just a hint of lemon. Next week, I’ll offer up a green veg recipe for the Thanksgiving table—if I don’t get distracted by a baby goat or a stray dog or something. Since Thanksgiving is a crazy cooking day, here are some make-ahead tips for this recipe: Dice, chop, and otherwise prep all the ingredients ahead. (And buy already-peeled butternut.) Then go ahead and sauté your leeks, garlic, and corn, too. (If you’re working hours ahead, refrigerate.) You can grease the gratin dish ahead as well. Then all you’ll have to do is combine and assemble before cooking. 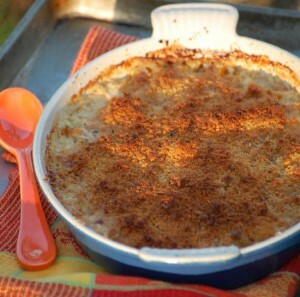 Heat the oven to 400 degrees F. Rub a 2-quart shallow gratin dish with 1 teaspoon of the butter. In a small bowl, combine the breadcrumbs, 1 tablespoon of the olive oil, 1/4 teaspoon salt and mix well. In a medium (10-inch) heavy nonstick skillet, melt the remaining 2 tablespoons of the butter with the remaining tablespoon of olive oil over medium-low heat. Add the leeks (with any water still clinging to them) and 1/4 teaspoon salt; cover, and cook, stirring occasionally, until softened and translucent, about 5 minutes. Uncover and continue to cook, stirring frequently, until the leeks are shrunken and lightly browned in places, 10 to 12 minutes more. (The pan will dry out.) Add the minced garlic and stir until softened and fragrant, about 30 seconds. Add the corn kernels, 1/4 teaspoon salt, and a few grinds of fresh pepper. 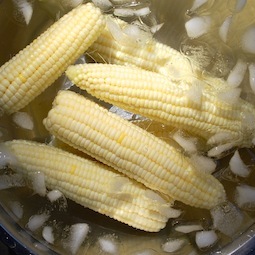 Cook, stirring, until the corn has lost its raw look, is glistening, and is slightly shrunken, about two minutes. Take the pan off the heat and let the mixture cool for five to ten minutes. Combine the heavy cream and the chicken broth in a liquid measure. Add the lemon zest, a scant 1/2 teaspoon salt, and a few grinds of pepper. Stir to mix well. Add the corn-leek mixture and the herbs to the diced squash and toss well to combine. Transfer the mixture to the gratin dish and arrange as evenly as possible. Sprinkle the Parmigiano on the vegetables. Stir the cream mixture one more time and pour and drizzle it over everything. Be sure to scrape out any seasonings left in the liquid measure. Sprinkle the breadcrumbs evenly over all. 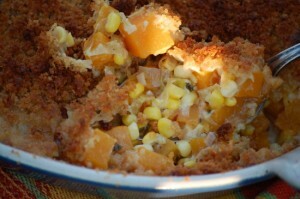 Bake until the crumb topping is deep golden and the squash is tender when pierced with a fork, 42 to 45 minutes. The juices should have bubbled below the surface of the vegetables, leaving browned bits in a line around the edge of the pan. This week I had to write my own book review for the Huffington Post. A little awkward, yes indeedy. But a good opportunity, so I took it. 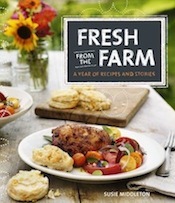 The fun part was choosing a sample recipe from Fast, Fresh & Green that I thought a wide range of people might like—and that was spot-on seasonal. My first thought: Corn. Second thought: Corn Sauté. 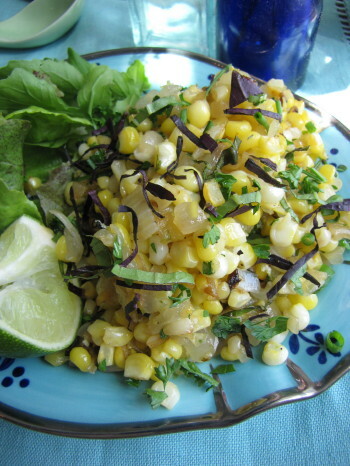 Third thought: Corn Sauté with Chile & Lime. Choosing a corn recipe wasn’t a hard decision. I have a not-very-well-kept-secret sweet tooth, and I’ve loved good fresh corn since I was a kid. (The grown-up in me adds stuff like lime and chiles to temper the sweetness.) And up here in New England, the first corn is just starting to come in from the fields; so that means folks south of us are already indulging. The timing for a corn recipe was perfect. Plus, I couldn’t stop thinking about corn for another reason: It’s birthday week. My Dad is turning 80 tomorrow, I am turning um…well, something that ends in 8…on Sunday, and Libby turned 8 today! To celebrate with Dad, we are hopping in the car and driving down to Lewes, Delaware, where I spent my childhood summers—and first fell in love with corn. In those days (the dark ages, I know), the highway into town was lined with hundreds of acres of corn fields. (Now many of those fields are golf courses and retirement communities.) 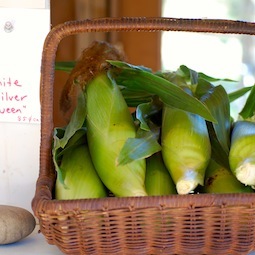 And all that corn was the pearly white, super sweet variety known as Silver Queen. The kernels were always tiny and juicy—not only delicious, but much easier on the teeth than this tough stuff you get in the grocery store these days. I’ve been told there’s an even sweeter variety of white corn around now, but I don’t seem to find either that or Silver Queen up here much. New Englanders seem partial to Butter and Sugar (yellow and white) varieties. When we celebrate everyone’s birthday on Saturday, two things I know for sure. We’ll have corn and we’ll have chocolate cake. It might not be corn on the cob, slathered with butter, as it used to be. It might be one of my corn-off-the-cob sautés (a little easier on the teeth and oh, so tasty! ), hopefully made with Silver Queen. And it won’t be my grandmother Honey’s famous chocolate cake. (She’s the one to whom I dedicated Fast, Fresh & Green. She was such a seat-of-the-pants great cook that no one can actually recreate that cake.) But I’m planning to make one of my favorite easy Fine Cooking recipes, Alice Medrich’s Fastest Fudge Cake. 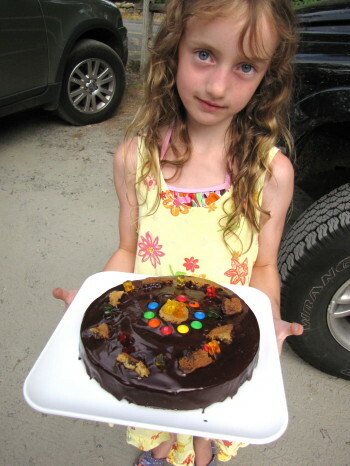 Libby and I made it last weekend in anticipation of her birthday, and after I poured the fancy-looking ganache on top, she decorated it with M& Ms, gummy bears, and pieces of (homemade) chocolate chip cookies! We carried the cake to the beach, and 20 people must have stopped us along the way to coo over the cake (and Libby). I think my 80-year-old Dad will enjoy it as much as she did. All this thinking and writing about corn was too much for me, though. 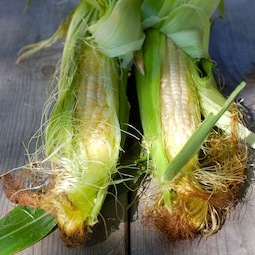 I couldn’t wait until Saturday for Silver Queen, so I bought some New England corn yesterday and made one of my sautés. (Recipe follows.) 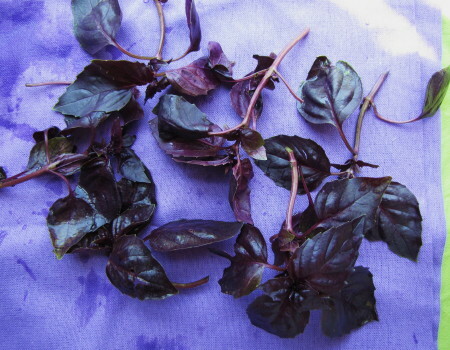 I substituted a few things in the Fast, Fresh & Green recipe, adding fresh ginger and garlic and taking out the chile powder, and using purple basil (rescued from the farm stand—it doesn’t sell), chives, and parsley in place of the cilantro. Kept the lime though. (You could sub lemon if you wanted.) Wow, this one was so good—the lime/ginger/sweet onion/sharp basil thing with that sweet corn really works—that I combined the leftovers with a little goat cheese and put them in a frittata for lunch. Just for me, of course. Sweet. Don’t worry when you see a lot of brown stuff building up on the bottom of the pan. 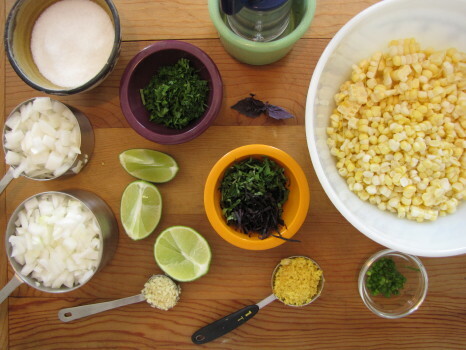 When you sauté corn, it always releases a bit of starch, which causes the browning. That brown stuff tastes really good though, so I incorporate a couple ways to get it back into the sauté. First, I suggest that you let the sauté sit for a few minutes in the pan after cooking. As the vegetables rest, they (especially the onions) will release some moisture that will loosen some of the browned bits, and you can then stir them in. Secondly, after you squeeze the lime in, you can use that bit of added moisture to get a bit more of the browned bits up. A wooden spoon works best for this. 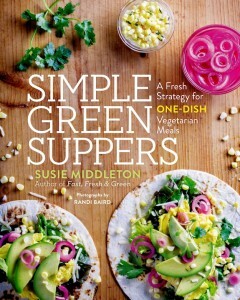 Melt 1 tablespoon of the butter with the olive oil in a 10-inch straight-sided skillet over medium-low heat. Add the onions and 1/2 teaspoon salt, cover, and cook, stirring occasionally, until translucent, about 5 minutes. Uncover, turn up the heat to medium, and sauté, stirring frequently, until lightly browned, another 4 to 5 minutes. Add the remaining 1 teaspoon butter, the corn kernels, and another 1/2 teaspoon salt. Cook, stirring frequently and scraping the bottom of the pan with a wooden spoon, until the corn is tender but still slightly toothy to the bite, 4 to 5 minutes. (It will begin to intensify in color, glisten, and be somewhat shrunken in size). Add the ginger and garlic and cook, stirring, until very fragrant, 30 seconds to 1 minute. Stir in the lime zest and remove the pan from the heat. Let the corn sauté sit undisturbed for 2 to 3 minutes (moisture released from the vegetables as they sit will loosen browned bits) and stir again, scraping up the browned bits from the bottom of the pan. Season the sauté with a few generous grinds of pepper and a good squeeze of the lime. Stir in half of the herbs. Let sit for another couple of minutes if you have time. Stir and season to taste with more salt, pepper, or lime juice. Stir in the remaining herbs just before serving. Tip: I find the safest way to cut corn off the cob is to snap the shucked ears in half first. This takes a little elbow grease, but works fine. Then put one half, cut side facing down, on a large cutting board and slice down the cob with a sharp knife using a sawing motion. Keep turning the cob until you’ve cut off all the kernels. Repeat with the other half. For convenience, I also put a large (old) dishtowel over my cutting board before I start. When I’m done cutting, I can fold the corners of the towel up and easily transfer the kernels to a bowl. Any way you do it, be aware that corn kernels do have a tendency to go flying when you cut them.